You can play Super Famicom games on your SNES by removing 2 plastic tabs that are located inside the cartridge slot – it’s not difficult. Note 1: Want more Final Fight? Check out my reviews of MIghty Final Fight and Final Fight 2! Also, if you’re interested in more Beat ‘Em Ups, check out my reviews of Double Dragon II, D & D, Warriors of Fate, Crows: The Battle Action, Bare Knuckle III,Sengoku 3, and Nekketsu Oyako! Quick History: Most gamers are familiar with Final Fight, the arcade game released in 1989, or rather, it’s SNES port, released in 1991. The SNES version of Final Fight was a launch title for the SNES, and many who bought the system picked up this game, as it was one of only a few games avaliable at the time. While the SNES version was well-received and, while not a direct arcade port, looks quite comparable to its arcade counterpart, it was criticized on a number of points, most notably (behind the removal of 2 player co-op) was the removal of one of the game’s 3 selectable characters: Guy (perhaps pronounced ‘Gui’ – I really have no idea). 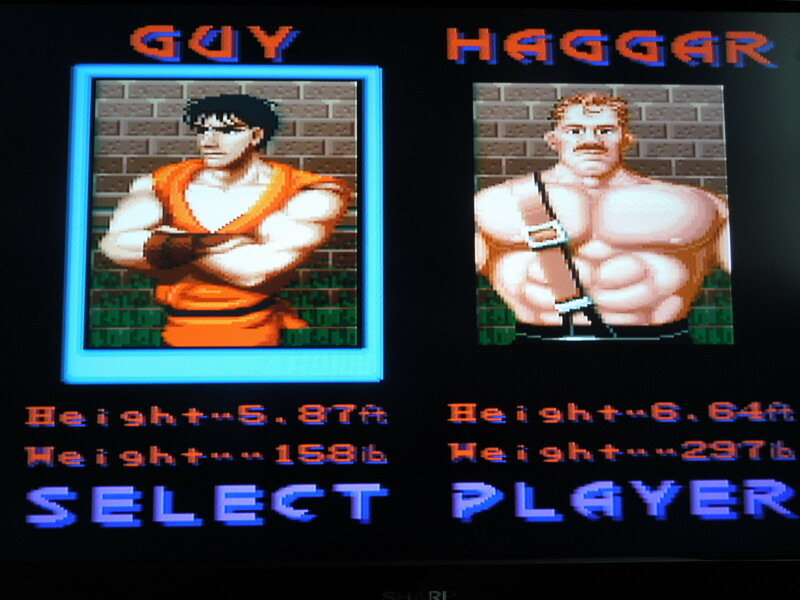 The game’s other 2 characters, Cody and Haggar, were still included. Additionally, the SNES version, released in the North American region, further edited or ‘censored’ the game by removing health pick-ups in the game like ‘Whiskey’ and ‘Beer’ and replacing female enemies with male ones (evidently Capcom didn’t want any issues being raised with violence against women). In Japan, however, Final Fight for the Super Famicom left in these arcade features – but stil left out Guy. So, in 1992, Japan released Final Fight Guy to appease fans who were displeased at Guy’s removal from the original Final Fight. Guy replaced Cody this time, leaving still only 2 selectable characters: Guy and Haggar. Final Fight Guy was also released for the SNES in the U.S., but it was only avaliable for a very, very short time, and was more commonly avaliable as a Blockbuster Video exclusive rental. 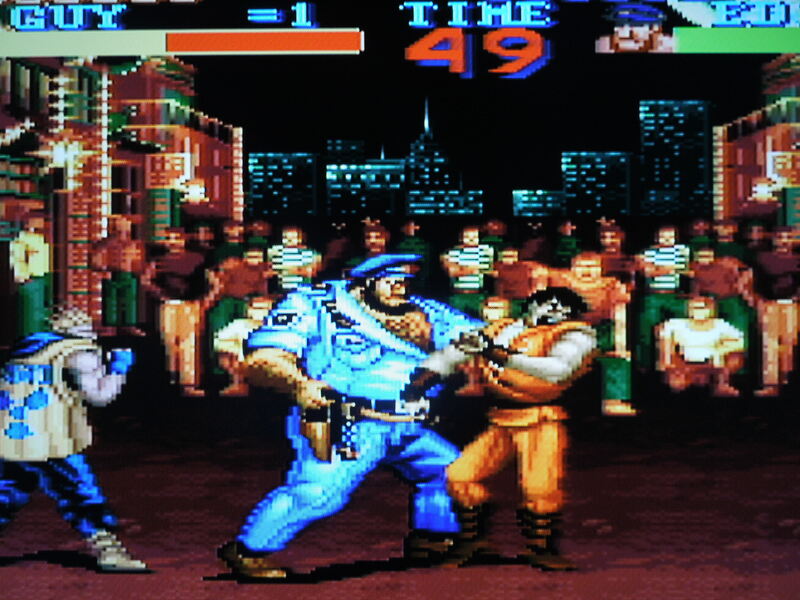 While the SNES version did include Guy (while still removing Cody), it still kept the previously censored material intact – so still, ‘no alcohol health items’ and ‘no women enemies.’ Because of its limited release, the SNES Final Fight Guy cartridge goes for over $200.00 on ebay, while the Super Famicom Final Fight Guy, because of its broad commerical release (in Japan), is easily affordable. This review is for the Super Famicom Final Fight Guy. Regardless of the region, either U.S. or Japan, many game fans are unaware of the existence of Final Fight Guy, making it ‘obscure’ by the Southern Gentleman’s definition. The story is in Japanese, and it goes like this: A gang kidnaps the mayor’s daughter – you whip everybody in sight to get her back. The End. Gameplay: The story is simple in Final Fight Guy: Jessica, the daughter of Mayor Haggar, has been kidnapped by the Mad Gear Gang in crime-ridden Metro City in 1990. 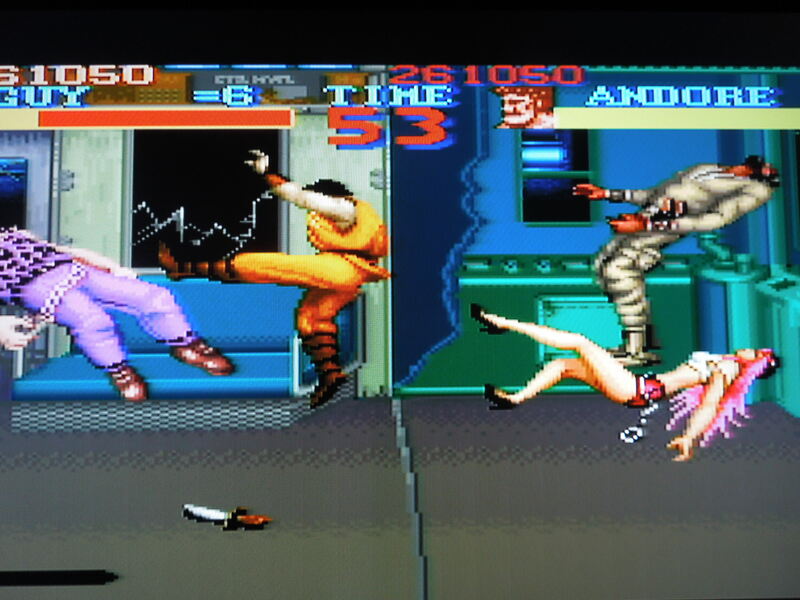 Mayor Haggar and Guy, a ninja, decide to go after the Mad Gear gang, refusing any diplomatic relations, and basically beat up any thug who gets in their way. Guy is quick and less powerful; Haggar is slower yet stronger. You fight through 5 levels, from the streets of Metro City to the penthouse of the game’s final boss on your quest to rescue Jessica. Along the way, you deal out your own brand of justice with your fists, knives, pipes, and swords. Controls: You use only 2 buttons in the game (aside from the control pad): B and Y. Pressing Y punches – rapidly pressing it will create a combo. B jumps. Pressing B while standing will cause a vertical kick. Jumping either right or left and pressing Y will execute a horizontal kick. 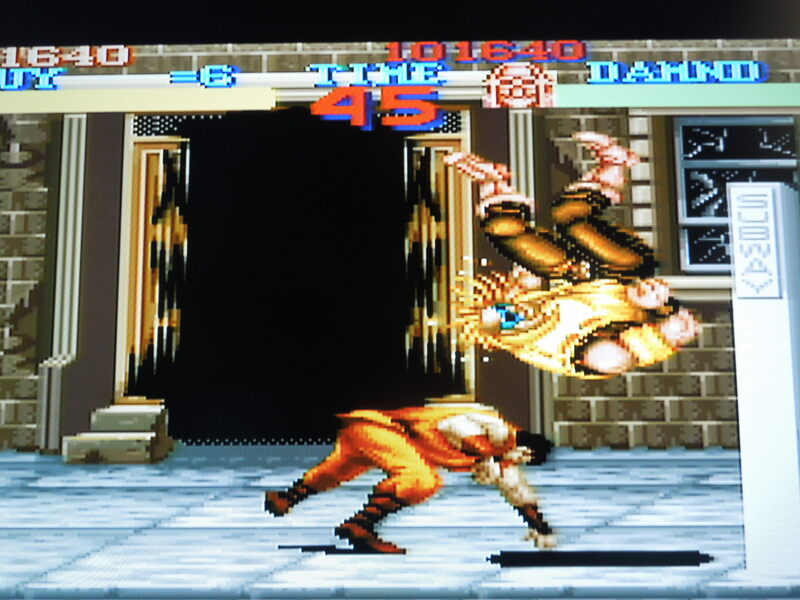 Jumping right or left and pressing Y while holding down will execute a knee smash (Guy) or flying body attack (Haggar). Getting in close to an enemy will cause your character to automatically grab him or her. When an enemy is grabbed, pressing Y will knee him in the face (Guy) or headbutt him (Haggar) – if you press Y + right or left, you’ll throw (Guy) or German-Suplex (Haggar) your opponent. Additionally, when an opponent is grabbed, Haggar can press B to jump with the enemy and then press Y to pile drive him. Guy can ‘wall jump’ by pressing B to jump left or right and then B again when contacting a wall. Hitting B + Y will execute your character’s special move, which will drain some of your energy if you connect with an enemy. Sound and Music: Music is so-so; it works, but nothing will stand out to you. The sound effects are great. When you hit an enemy, it really sounds like you’re making it hurt. 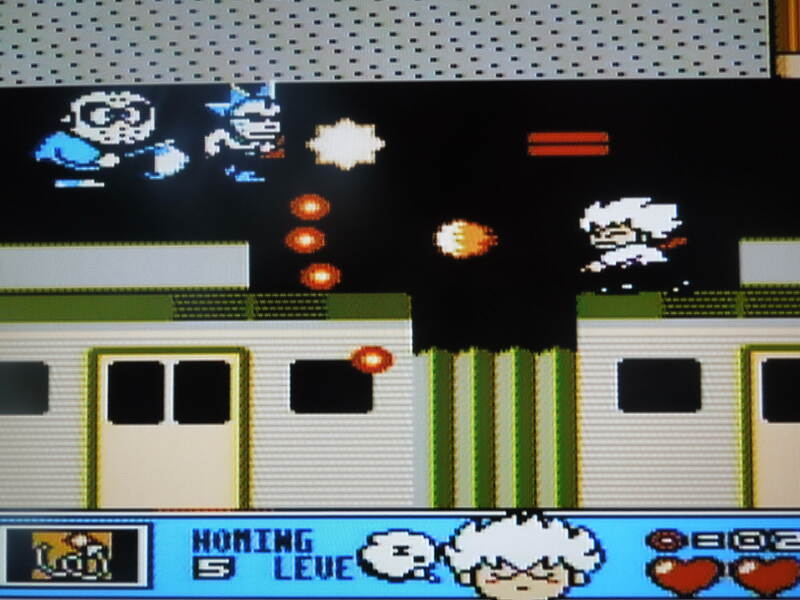 The game’s feature character, a ninja named Guy, is quick at dealing out justice. Language Barrier? No. The only thing in Japanese is the story that plays in the game’s intro and ending. You can gather what’s happening from the image screens, though. Everything else is in English – Options menu, character and enemy names, item pickups. Options? The Options menu isn’t immediately accessible. To access it, Hold button L on your SNES controller and press Start on the Start Screen. Here, you can change the difficulty, add lives, and, most importantly, turn on ‘Extra Joy.’ This assigns your special attack to Button A, meaning you don’t have to press B + Y anymore. Differences between Japanese Super Famicom Final Fight Guy and U.S. Super Nintendo Final Fight Guy: Remember, the Japanese version is more arcade accurate, while the U.S. version was heavily censored due to Nintendo of America’s strict policy of no drugs and alcohol in games, no religious references, etc. The Japanese version had Poison and Roxy, two female enemies – they were replaced with Billy and Sid in the U.S. version. This Japanese version has a small blood spurt when you stab an enemy – the SNES version removed it. The Japanese version has Whiskey and Beer health items – the U.S. version removed these. In the ‘car smash’ bonus round, the enemy proclaims ‘Oh my God!’ in the Japanese version – in the U.S. version, he says “Oh! My car!” Also, two enemies, Bred and Simmons, have very dark skin in the Japanese version and much lighter skin in the U.S. version. Two of the game’s bosses, Damnd and Sodom, have had their names changed in the U.S. version to Thrasher and Katana, respectively. Execute your special attack when you’re surrounded. 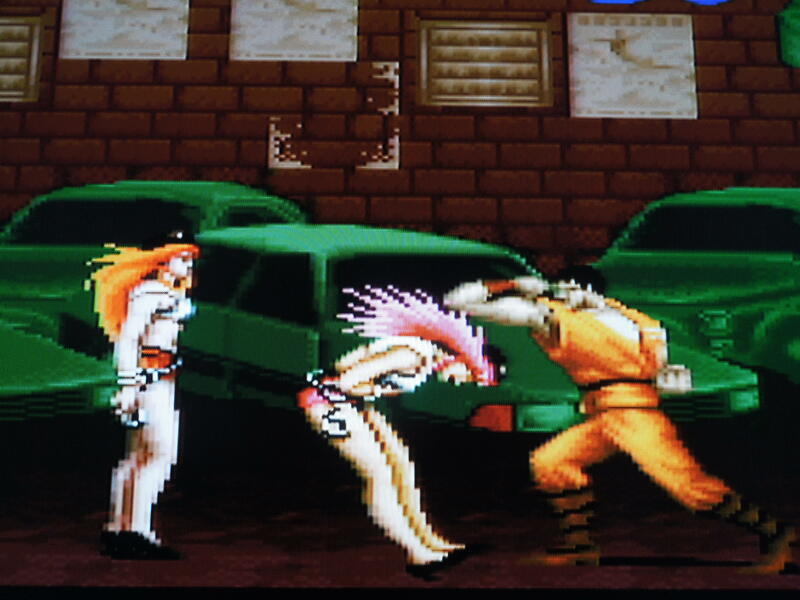 The two female enemies found in this game, Roxy and Poison, were removed from the U.S. version. Items: By breaking barrels, you can pick up knives, pipes, and swords to use on enemies. You can also pick up health food items to regain your life bar: chicken, barbecue, oranges, apples, pineapples, beer, whiskey, sushi…to name a few. You can also pick up a ‘Jessica doll’ for temporary invincibility or a ‘Guy doll’ or ‘Haggar doll’ for an extra life. So, where can I find this game? 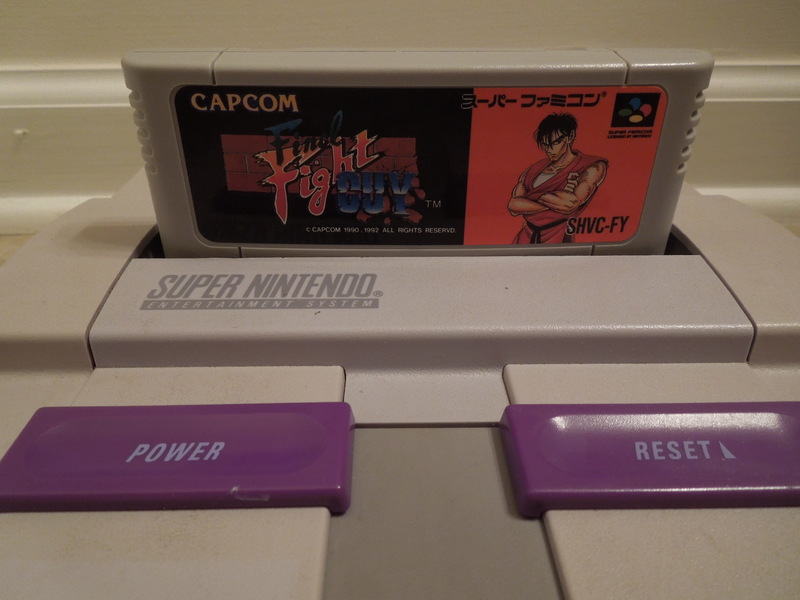 Ebay – remember, this exact game, Final Fight Guy for the Super Famicom, is quite common and cheaper, but the U.S. Final Fight Guy, which is censored, is much more expensive. The arcade version of Final Fight, which is longer, includes all 3 characters, 2 player cooperative gameplay, and generally looks a little better, is avaliable on multiple modern-day gaming console’s download services. They allow you to play online, have online leaderboards, etc. Conclusion: So, why would I hunt this game down when I can download a better version for my PS3, in HD, no less? The only answer I have for that is the reason I started this website: playing hard copies of games on their original hardware console is the best way to go! Final Fight Guy is interesting in that it is, essentially, the same game as Final Fight, with only 1 playable character being swapped out for another. Of course, the differences between the Japanese and U.S. versions is intriguing. The game should have been 2 player c0operative like the arcade game it is based on – not just 1 player. Still, it is one of the smoothest, easiest-to-handle, and addictive Beat ‘Em Ups I’ve ever played. Beating the living heck out of jerks never felt so good. Good luck if you put it on the ‘Expert’ difficulty. Some of the bosses are tough until you figure out their patterns. This entry was posted in Super Famicom - Final Fight Guy and tagged Final Fight Guy Review (SNES). Bookmark the permalink.